Philippinefails: Why didn't Duterte Declare Martial Law in November 2016? Why didn't Duterte Declare Martial Law in November 2016? 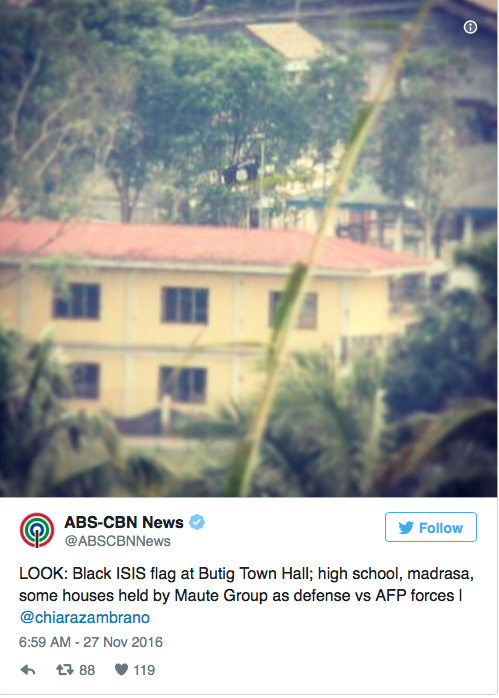 In November 2016 the Maute group occupied the city of Butig even going so far as to raise the flag of ISIS over the town hall. 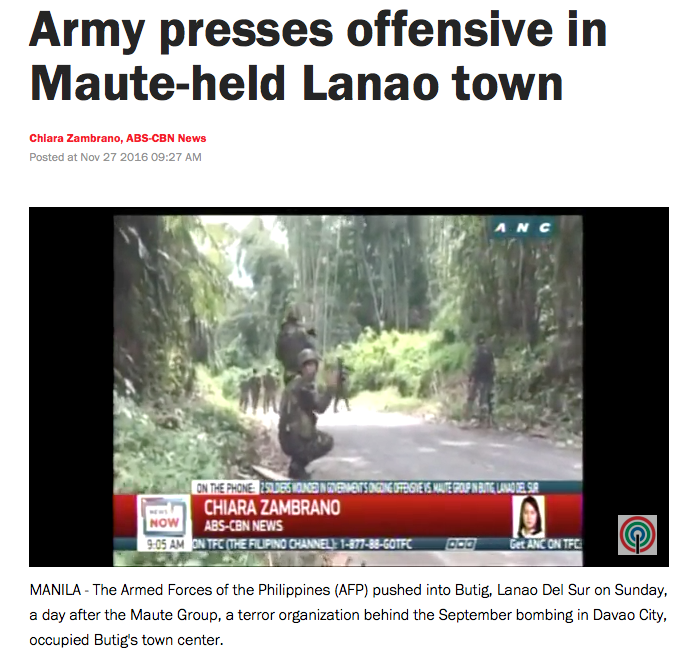 The Armed Forces of the Philippines (AFP) pushed into Butig, Lanao Del Sur on Sunday, a day after the Maute Group, a terror organization behind the September bombing in Davao City, occupied Butig's town centre. The AFP estimated that from 200 terrorists on Saturday, around 300 men armed with grenade launchers are now occupying the town. Though no direct link has yet been established with ISIS, the Maute group’s alleged leaders, brothers Omar and Abdullah Maute, have already pledged allegiance to the terrorist group and even use their name and symbol. 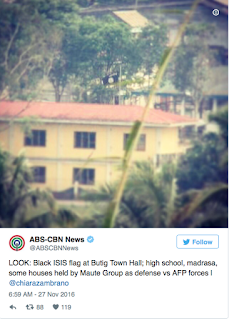 This coming five months after clashes between the AFP and Maute group in the same city, Butig. At least 22 members of a local terror group based in Butig, Lanao del Sur, had been killed in a series of clashes with government troops there since May 26, the military said on Saturday. Two soldiers were also slain and nine other government troopers had been injured in the clashes, according to Maj. Filemon Tan, the spokesperson of the military’s Western Mindanao Command based in Zamboanga City. Tan, whose unit has jurisdiction over Lanao del Sur and other areas of the Autonomous Region in Muslim Mindanao, said government forces launched a massive military operation in Butig against the Maute group. The group had allegedly professed allegiance to the Islamic State of Iraq and Syria or Isis. This is the same thing that happened in Marawi City albeit on a smaller scale. A city was occupied and the AFP was sent in to liberate the city. But instead of following a scorched earth policy and ridding the Philippines of this group, the AFP ceased operations and a few months later the same scenario repeated itself. So why didn't Duterte call declare martial law back in November? Because he didn't feel like it.